Writing is a fun process that allows you to leave the dreariness of your everyday life behind and escape into another world filled with three-dimensional characters, imagery, and scenarios that exist only in the depths of your own wildest imagination. While you are writing, you are only limited by your own imagination and the possibilities are endless. When you’re thinking and elaborating on a topic that you feel passionate about, your mind takes you in many different directions, including some you hadn’t thought of previously. Creating something out of nothing and following it through to a conclusion gives the writer a great sense of accomplishment. While writing is enjoyable for some people, for others it is extremely difficult and a major source of frustration. Issues with grammar, spelling, style, and flow can have writers pulling their hair out by the roots and banging their heads against a wall. Writing about a topic that you don’t find interesting is incredibly painstaking, as you attempt to focus on the subject area long enough to convey it properly to the reader. In the same respect, topics that you’re not familiar with will require a lot of daunting and tedious research before you can even begin to put your pen to paper, or your fingers to the keyboard. Sometimes it’s fun to research and learn about new topics, but it can also be a long and seemingly endless process. Another issue that all writers experience at one point or another is writer’s block. Writer’s block is the Achilles heel of every writer and is often difficult to overcome. The overwhelming feeling of impending doom as you stare at a blank page is both daunting and disheartening. 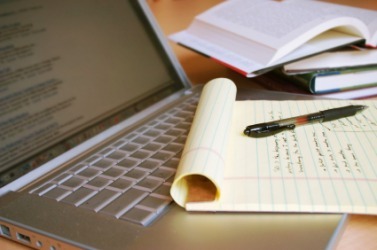 Writing courses are an excellent way to overcome obstacles, so that you can begin to enjoy the writing process. Taking a writing course will improve your writing, grammar, style, vocabulary, and flow as you complete the exercises. Designed to stimulate your creative juices and hone your skills, writing exercises improve your thought processes. Just as bodybuilders lift weights to strengthen their muscles, writing exercises will strengthen your mind and help you learn to better express your ideas through your writing. Writing courses will also teach you how to research effectively and how to think differently, helping you open yourself up to new ideas and new approaches. Writing courses will also give you an audience for your creations and the opportunity to receive feedback. Constructive criticism is essential to developing technique and polishing your writing. One of the greatest benefits of creative writing courses is practice. Practice makes perfect, especially when it comes to writing. You will notice that the more you write, the better you will be at it, and the more you will enjoy it. If you’re serious about improving your writing skills, a writing course will give you the prowess you need to overcome the hurdles, so you can learn to enjoy writing.